Studio L 3 GM05: A new Dimension! A 6 X 6 wall hanging that fit right in with the Royal Wedding today. Seems like everything went off with out a hitch across the pond and the two newlyweds do make an elegant couple. The Quirky Crafts Challenge Blog is new to me and it looks like it's going to a fun one to have on the list because they like to see artists use all kinds of materials and make lots of different projects. Can't forget to give a shout out to Tim. I used quite a few of his products on this project and this embedding technique is very interesting. After you've seen what I have done with these 3 challenges don't forget to click on the links and check out all the other talented and clever artists that have entered these challenges as well. A perfect royal theme. you rocked this challenge! great tribute to the royal day! Love that little crown. 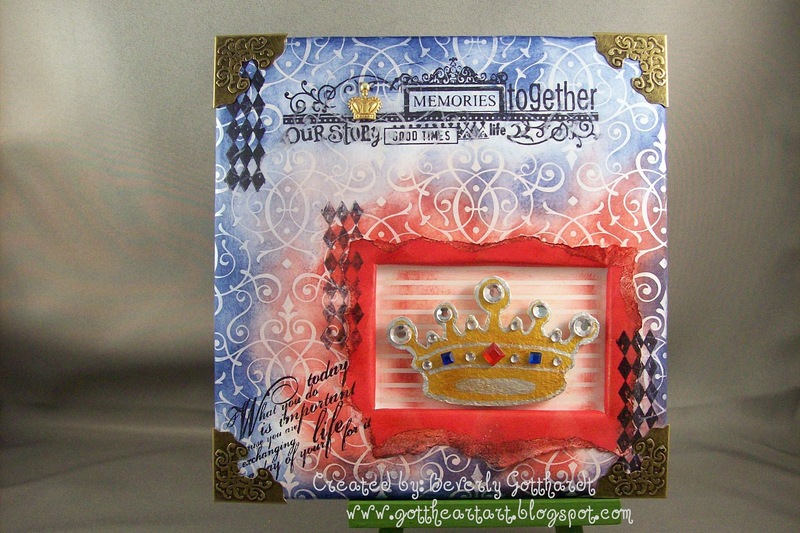 SO regal and what a perfect project to showcase the crown. WOW! Lovely bright colors and I like the theme too! This is grand, Beverly, loving the art you've created - fits in perfectly with our Crown Jewels challenge! Great colors, great style, very regal and rich! Thank you for playing with us at Opus Gluei! WONDERFUL piece. I love that you used red, white an blue. Too cool. Also love that you used Tim's technique. I'll have to try that out now. Thanks so much for playing with us at OPUS GLUEI. Great hanging, love the theme you picked, thanks for playing along with Linda's Grungy Monday. This is just gorgeous! great piece. ohoo yes, very Royal! I lOvE the corners! thank you for joining Quirky Crafts challenge, don't forget to pop back this Friday /Saturday to vote for your favourites and ask your blogging buddies to vote for you too.